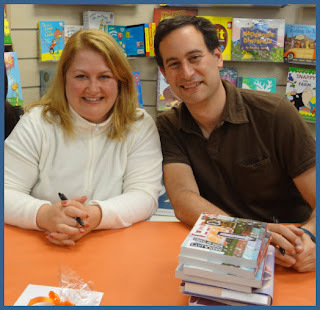 On Monday, October 22nd I had the pleasure of meeting two great authors, David Levithan and Rachel Cohn, when they visited a local independent bookstore by me. I love Mrs. Nelson’s bookstore because I get the chance to meet amazing authors in such an intimate setting. Not to mention, I also get myself in trouble by browsing their book collection and spending a bit too much! But I digress. 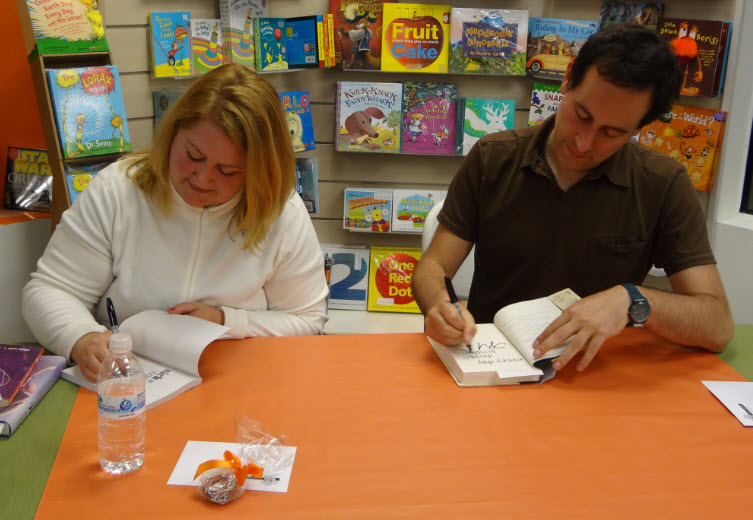 :) Back to the signing… It was great to meet both of these authors. They were funny, witty and very entertaining from the moment they sat down to talk to us. They joked about the treats on the table, the awkward silence they’ve learned to embrace at signings, and their love of writing to name a few topics. David Levithan started off the event by reading from his book Every Day, which is about a soul with no body named A. I was immediately mesmerized, whether it was because of his narration or the actually story, I don’t know, but I was glued to every word he said… the story sounds amazing and I can’t wait to read it. Next, Rachel Cohn treated the crowd by reading an excerpt from her novel Beta, which we learned is a four book series. Coincidentally, her story is about a body with no soul named Elysia. Keep in mind, these two books were independent works for both of them, so you can’t ignore how in tune these authors are with each other even when they aren’t co-writing. It was great to hear these two authors banter back and forth, and their natural camaraderie was refreshing. So it’s no surprise what a perfect pair they make when co-authoring hits such as Nick & Norah, Dash & Lily, and Naomi & Ely. A fun fact they shared about their writing process is that they typically don’t have a set outline and stream of events when starting a book together. They have an idea, one of them gets to pick the names, and then they tag team back and forth to bring it to life. They were asked if any other books would possibly be hitting the big screen. David and Rachel shared that their experience with Nick & Norah going Hollywood was epic, and they have hope that their other books will have the same experience, but nothing to report as of yet. David and Rachel also shared their writing techniques for aspiring authors with regards to writing groups and getting feedback from fellow authors. Where Rachel started off in a writer’s group, she’s since moved away from that to write on her own. David relies on his editor of 10 years for feedback, and she’s typically the first person that will read his book once it’s complete. Overall, I had a fabulous time! 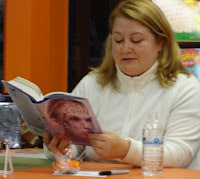 I was able to enjoy this author event once again with my Goodreads/bloggy friend Rachel from The Readers Den. It was nice to see that I’m not the only one that gets excited when it’s my turn to get my books signed. :) We were both a bit giddy and smiley when it was our turn to get our bundles signed. I really enjoyed my time at this signing and to be able to hang out with another book friend made it even more awesome! Thanks Rachel! 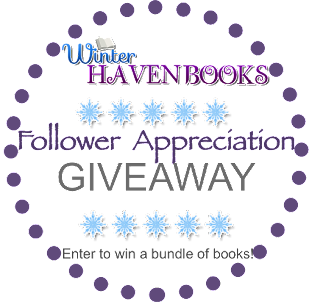 For today’s giveaway, one lucky WinterHaven follower will receive the following bundle and all THREE books were signed by the David Levithan and Rachel Cohn. All you have to do is fill out the rafflecopter and share a thoughtful comment on my visit, the authors or the books… anything will do. I’d just love to hear from you. :D Good Luck!! We've been lucky these last couple of years. You can always move here... just be sure to bring your bookshelf with you. :) Thank you! Welcome erin to our little WinterHaven! :) I heard that Crystal won the give-away! So excited!! I'll be stalking her shelves to see what she gets. :P Thank you so much for stopping by! Love this post, Arlene. 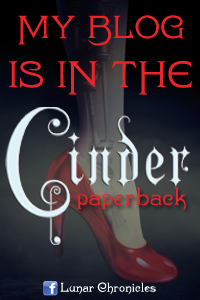 :) It's so fun you got to meet authors you love! AND that you hung out with Rachel! I really liked EVERY DAY, although I have to confess I wasn't a huge fan of BETA. Thank so much Wendy D!! I've enjoyed hanging out with Rachel. It's always nice to find another book friend. :) I'm excited about Every Day it sounded so so so good!! Sorry you didn't care for Beta. I'll have to check out your review to make a decision on that one. I love going to book signing and getting to see the authors in real life. Thanks for your awesome coverage of this cool event! Sounds like a fun time. I love that they bantered! They are such a fun pair! You're welcome and good luck! These books are good, haven`t read them yet but I`ve heard/read a lot of great comments/revies about them. Me too! I heard Every Day was awesome. I can't wait to read it. Good luck on the giveaway! I love your blog's winter style theme. Awesome giveaway! Thanks for hosting it. This looks like so much fun! I would love to go to author events/signings, but they never come near where I live. I can't wait to read Every Day - it sounds really interesting. Thanks for the awesome giveaway! They we fun to visit with. I hope you get some author your way soon. You're welcome and good luck! This looked like it was a blast!! I love signing and readings they are always so much fun. 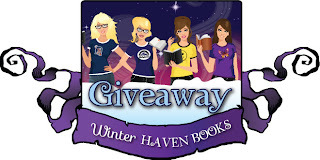 Great blog and thanks for the chance to win. 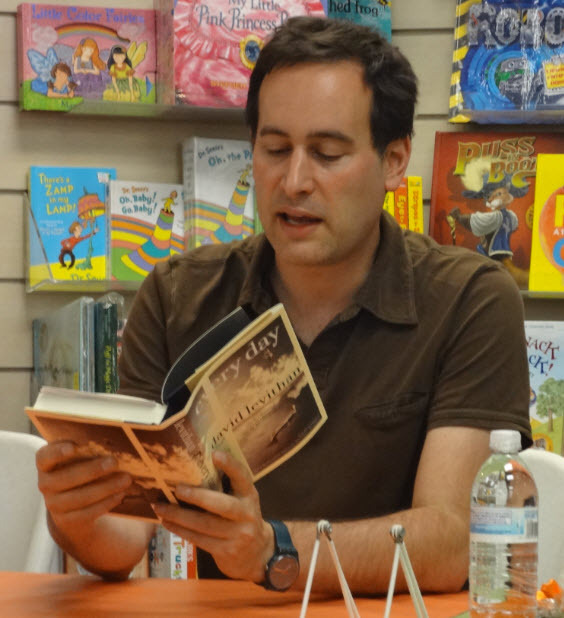 I hear that Every Day by David Levithan was amazing! I cant wait to read it! The other boosk look awesome too! Thanks for the giveaway! I heard it was amazing too. You're welcome and good luck! Sounds like you had a great time. I have already had my eye on Every Day and the others sound wonderful as well. Every Day seems to be pretty popular. Thanks for stopping by! Wow you guys get to go to the best author events! It sounds like you had a great time! Thanks for sharing your experience and for the giveaway! I really did and it was nice to meet a fellow book friend too. You're welcome and good luck! We got to meet David recently too and he was SO nice! Very cool guy! I agree Ange. He's super sweet! I love Nick&Norah, which is stuck on my broken kindle and so I'm sad, and Every Day is a book I'm really excited to read. So lucky you got to go to this event! I've been very curious about Every Day. I've heard some positives and not so positives. It seems like a very good hypothetical experiment on the human condition. Well I hope you enjoy it if you decide to give it a try Diana. Thanks for stopping by! I read the sample of Beta on the publisher's facebook page. It is so thought provoking. I really would love signed copies of these great books. who am supposed to facebook friend? is a link not showing up? I can't wait to read Beta. This was so cool, that both authors were there. Such s great giveaway. Thank you! I love all three books these two have written together! I think Dash&Lily was my favorite, but that's probably becasue it was the first I'd read by them. They're all amazing, though. I positively am dying to read Every Day. 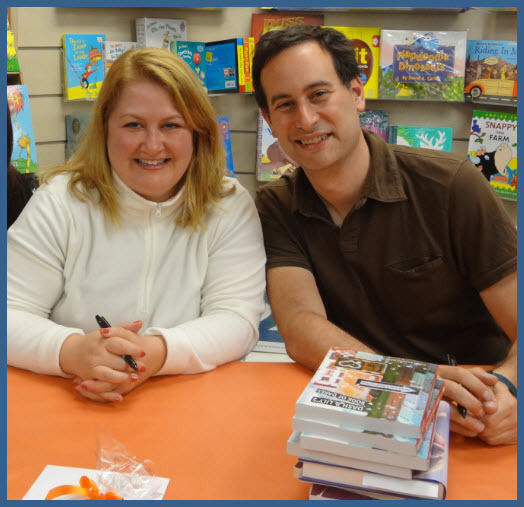 I've met both these authors (seperately, not together--sadly I'm not that lucky) and they were both fun to be around. Especially David. Hehe. Oooo, surprises. I love those! I just started thinking up plans for my Winter Sleigh posts, and I have a huge feeling yours are going to beat mine, ha! I can't wait to see! Thanks for such a great giveaway! 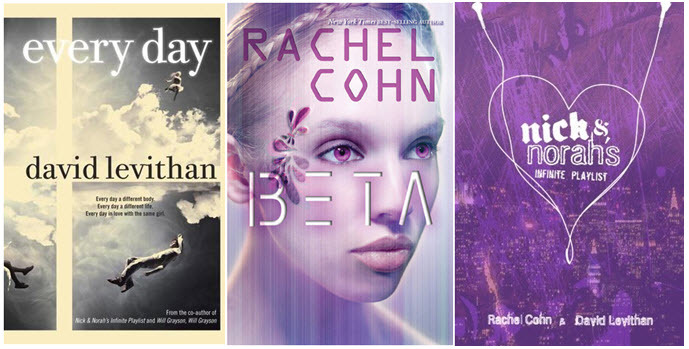 :) All of these are at the top of my list - I love both authors! It literally hurt when this book ended. I almost wish it never ended. It was as if I fell in love.